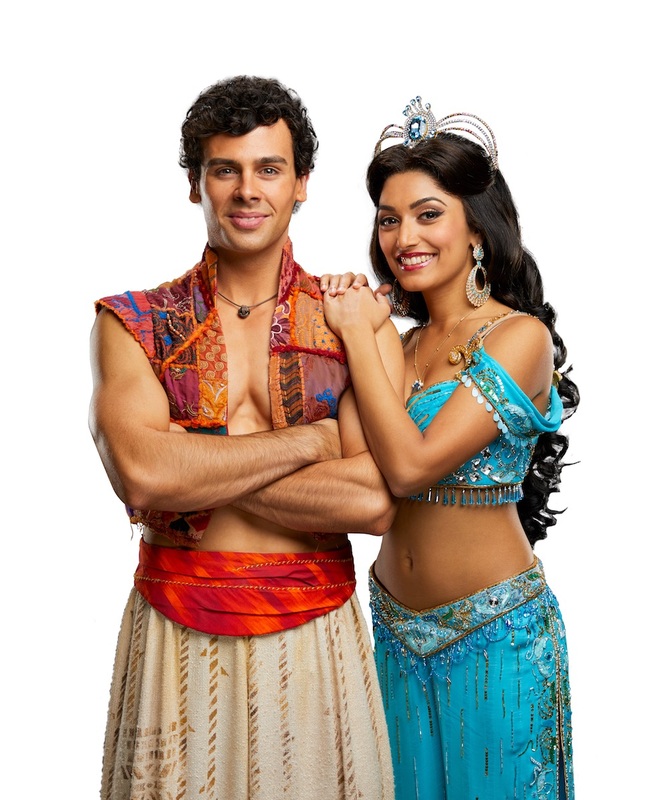 Iconic Disney musical Aladdin comes to Crown Theatre from July 19 in one of our city’s most anticipated theatrical spectaculars. NATALIE GILES spoke to the new Princess Jasmine, Perth born Shubshri Kandiah ahead of her eagerly anticipated professional theatrical debut on Perth stages after wowing Brisbane audiences. 23 year old Shubshri only graduated from Queensland Conservatorium at Griffith University in December 2017, but this home grown princess is already crushing it and doing us proud. Aladdin runs from July 19 to October 21 at Crown Theatre. Details available HERE. Welcome home! Let’s talk Perth. Are your family still here? Where did you grow up? I grew up mostly in Applecross, where my family still lives now, but we’ve lived all over Perth. I went to St Pius X Catholic Primary School in Manning, which is a bit weird as I’m Hindu, then I went to Penrhos in high school. After that, I did two years of university here and did primary education at Curtin for a couple of years but I didn’t really love it, you know? I really missed performing so when I got into Griffith it just made sense. Well, when I was a kid I was really involved with doing Indian stuff, you know? My mum is a dance teacher here, teaching traditional Indian dance so I grew up doing Indian dance and was always heavily involved with the Indian community. I also did ballet, but it wasn’t until high school that I discovered musical theatre. I never thought of it too seriously at the time – it was just something that I loved to do. I guess when you’re thinking about careers in high school, you’re not really encouraged to head towards being a professional performer. So I went into teaching until I realised that my heart was in performing. How does your family feel about your career choice? I’m an only child, so mum wasn’t really happy about me moving to other side of the country to go to Griffith, but they’re really supportive. They were a bit unsure at first about performing and it not being a “proper job”, and mum queried me putting all my eggs in one basket, in a career which can be a bit unstable. But now they’re really proud. Mum flew over for my first week of performing in Aladdin, and she saw four shows in five days. And of course she’s coming again for opening night in Perth and will probably come to see it multiple times in Perth too. And dad asked for a poster like it was the biggest ask in the world, because he wants to put it up in the house. He’s printed out every Aladdin article and collects newspaper clippings and he’s laminated all of them. You’ve said that seeing Princess Jasmine in the movie was the first time you’d seen someone who looked like you on screen. How important is representation in film to you? You said that you were ashamed of your Indian heritage when you were younger. What changed that for you? I guess leaving high school made a huge difference. School is such a bubble, then you get out there in the world and realise that what makes you different is what makes you special and you kind of learn to embrace and love it. Like, I used to hate going to temple but now I love it, and I love wearing Indian clothes. I love my culture. I miss it now, being in Brisbane. Actually, I think that made a huge difference to my outlook, too – when I moved away, suddenly all that was taken away and I realised how special it was. So that must make representing a woman of colour very special to you. What does Princess Jasmine mean to you personally? Princess Jasmine and Pocohontas were my favourite Disney princesses, because they were relatable for me. And Princess Jasmine is such a huge role model for me. Not so much as a kid, but more as an adult. I love that she’s so opinionated and strong, and she really stands up for what she believes in. I don’t think I’m much like that as a person, and she’s someone I aspire to be. She has everything most people want in the world – she lives in a castle and has jewels and everything you could dream of, but she’s willing to give all that up because she knows that’s not who she is, or what’s really important. She knows what she wants and she’s not afraid to risk everything to get it, and you’ve got to admire that courage and strength. You know that she was the first non-white Disney princess in their 55 year history, don’t you? No way! Oh wow. That’s so cool. That’s what makes this so important, don’t you think? It’s such an iconic role, so surely it’s daunting for you to take on in your first professional musical? You’d think I would feel nervous, but I’m honestly just having too much fun to worry about it. I know when they first told me I’d got the role I thought, “this can’t be happening. I don’t believe it.” But everyone has been so nice and I think it’s everyone’s calmness around me that’s made me feel so fine with it. It helps that everyone else knows what they’re doing because I’m coming in pretty late and they’ve been doing it so long, so that calmness has rubbed off on me and I’m feeling their confidence. I think I’m more excited by it, because it’s always been one of my dreams. That must be incredible then. 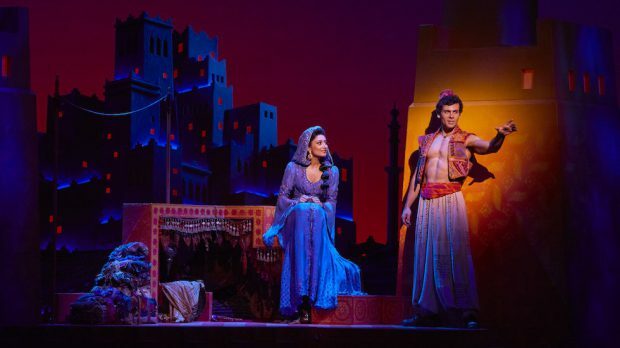 So what’s the most exhilarating part of playing Princess Jasmine for you? I love Disney music. And these are songs that my voice just loves to sing, do you know what I mean? You have some songs that just feel really good to sing. That’s the music in this production. It feels so natural and makes me feel happy. There were only five songs in the original movie but there are more written specifically for the theatrical version. Do you have a favourite? Oh, definitely! A Million Miles Away is my favourite for sure – it’s just so beautiful but not in the movie. You’ll hear it when you come to the show! But all of the songs are gorgeous. Of course A Whole New World is incredible to do too. Everyone’s favourite, I think. So please tell me you do the magic carpet scene. And how you do the carpet scene on stage? I can’t tell you! I’m so sorry! Just think of it as Disney magic. I mean, I’m on the carpet and all I can ever think is that it’s actually magical! It moves, it still blows me away. The carpet is just incredible. So what other magic can we expect? Obviously we now have humans in place of the wonderful animal characters. How do they translate? So Iago, Jafar’s parrot, is now a human sidekick and he’s so great. I mean, I was a bit upset initially too that there was no Raja the tiger or Abu, but the characters they’ve got to replace that are just so much fun. Like, Aladdin has got three friends who are the replacements for Abu, and they’re absolutely hilarious. My favourite scene in the entire show is the one that they do. They have their own song in the second act and I watch it on the screen in my dressing room and I’m laughing every night because it’s the funniest scene ever.